If I were a religious man, I'd have gotten down on my knees and offered a prayer of heavenly thanks after seeing the wholly wonderful new musical "Dogfight." As I'm not, that fervent thank-you goes instead to songwriters Benj Pasek and Justin Paul, book writer Peter Duchan, choreographer Christopher Gattelli, director Joe Mantello, and Second Stage Theatre. "Dogfight" is superbly crafted, gratifyingly intelligent, richly observant, and immensely enjoyable. This is musical theater at its finest. Intimate in scope yet emotionally expansive, the show is based on director Nancy Savoca's 1991 indie gem, which had a screenplay by Bob Comfort and starred River Phoenix and Lili Taylor. Framed as a flashback, the simple story follows Marine Eddie Birdlace, a working-class kid from Buffalo, N.Y., about to ship out to Vietnam. On his last night stateside, in San Francisco, Eddie and his two pals—Ralphie Boland and Dickie Bernstein, who go by the collective moniker of the three bees—have organized a "dogfight" for the evening's entertainment. It's a dance to which each Marine is supposed to bring the ugliest girl he can find. Everybody chips in to pay for the hall, band, etc., and the Marine who squires the worst "dog" gets what's left of the cash. After a number of rejections, Eddie meets Rose Fenny, a plain young waitress in love with folk music and her guitar, working in her mother's diner. His fast-talking pitch works on the shy, lonely girl despite her mother's skepticism. The rest of the show follows their adventures that evening. As good as it is, the film seemed an unlikely candidate for musicalization, as it is all about character and atmosphere. Furthermore, Phoenix's and Taylor's riveting performances benefit enormously from the camera's intimacy. But Pasek, Paul, and Duchan have been quite savvy in their choices of what should sing and what shouldn't, and the show moves forward with compelling dramatic force. Derek Klena and Lindsay Mendez are strong actor-singers and convey detail and nuance through the musical theater's equivalent of the close-up: the songs. And what songs they are, from Rose's nervously optimistic "Nothing Short of Wonderful" and achingly vulnerable "Pretty Funny" to the stunning Act 2 duet "First Date/Last Night" and Eddie's powerful climactic soliloquy, "Come Back." Klena is spot-on with Eddie's determined cockiness and smug surety that mask a more troubled, sensitive soul. Mendez is a luminous Rose, tougher and wiser than she appears and without a trace of self-pity. The two actors make this improbable pairing utterly believable and deeply touching. Mantello and Gattelli work together gracefully to deliver a seamless staging that makes effective use of David Zinn's ring revolve and two-story black metal catwalk set. Gattelli's excellent choreography is never showy, always generated from situation and character. It's also crucial to the success of a stylized battle scene that combines Paul Gallo's evocative lighting and Fitz Patton's skillful sound to potent effect. Zinn's costumes and Joshua Marquette's hair design successfully re-create two contrasting years of the 1960s with welcome subtlety. Mantello draws fine performances from the hard-working and very talented supporting cast of nine, especially Josh Segarra and Nick Blaemire, all testosterone and 'tude as Boland and Bernstein, and Annaleigh Ashford as Marcy, a pugnacious streetwalker with bad teeth whom Boland underhandedly hires to win the dogfight. Ashford takes the angry title song, which Marcy sings to a dumbfounded Rose, and hits it out of the park. It's extremely rare these days to encounter new writers working with such confidence and ability. Duchan's book is a model of self-effacing skill in translating a film to the stage. Pasek and Paul's score, astringently orchestrated by Michael Starobin, is melodically rich and quietly redolent of period while speaking in its own voice, with lyrics of artful simplicity and rigorous craft that reveal volumes. 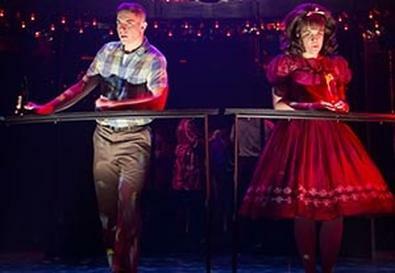 Their achievement demands recognition, and "Dogfight" deserves a long and healthy life on Broadway. Presented by and at Second Stage Theatre, 305 W. 43rd St., NYC. July 16–Aug. 19. Schedule varies. (212) 246-4422 or www.2st.com. Casting by Telsey + Company.